This page is where I will be listing all my sewing machine tips, just click on the highlighted link to view. Check back as I will be posting more soon. Greasing Gears on a vintage sewing machine (included in my Oiling a Vintage Sewing Machine post). Not really a tip but it is possible to re-paint an old sewing machine click on this link to see how. What you may want to take with you when buying a vintage sewing machine. Need to replace the belt on your vintage sewing machine? VIew this review and scroll towards the end of it to learn how to get an approximate measurement. Don’t know what type of shank your sewing machine has? Take a look at this image. Need a manual for your vintage KENMORE sewing machine? Take a look at my post here. Need a manual for your vintage SINGER sewing machine? Take a look at my post here. I believe that it may be the the setting controls, they need to be set correctly or the machine will not sew properly. I have a couple of sewing machines that are a bit temperamental like this. Do you have a manual for this machine? You can sign up at the Sears website, http://www.managemylife.com to get a free, downloaded copy of the manual. The diagrams may give you an idea of what the reverse mechanism and its parts looks like. Hopefully oiling it will take care of it. If not, and if your machine is truly sewing in reverse then it may be in the linkage somewhere inside which would probably best be taken care of by a repair tech. Hi Charles, what is your question about your machine? Oh, my gosh! Who knew there was a blot out in blogland like this? Where have I been? Stitch Nerd, you rock! I have been fighting the urge to “collect” sewing machines but I think I just lost the battle and with a great excuse in case my husband begins to catch on to me. I’ve been in mourning since I lost the love of my life, my 1976 Singer ATHENA 2000, to a lightning strike this past July. One day we will be together again but for now she’s been left to rest under the closed lid of her very own table. I haven’t even taken her in to let someone diagnose the problem because I’m terrified it will cost me an arm and two legs. So now I’m on the hunt for a replacement (aka beginning my dream vintage collection). Nevertheless, one day I will get my Athena repaired because she’ll always be my “first”. I’m wondering, Stitch Nerd, do you know anything about my Singer model? Or, if I told you that she was plugged in when lightning struck very close to our house and knocked out the whole house circuitbreaker. It rendered our phone, the cable modem, and a coffee maker absolutely useless, entirely fried. But my sewing machine which was also plugged in at the time still powers up… its just that the minute you flip the power switch it starts runnung about 100 miles-an-hour, no need to even touch the foot pedal. I’m worried its the circuitboard. Actually I’m more worried worried about letting just any old sewing machine repair person get their hands on her. As I said I’m already going to get me another vintage model of some sort (though I’m partial to Singers especially with slant shanks and drip in bobbins) but is there any advice you can give me about getting my Athena 2000 repaired? 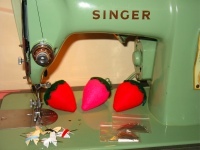 Pingback: Resources For Better Retro Sewing | "Retro vintage sewing and pretty earrings"
I have a singer athena 2000 and I am trying to replace the feed dog. How do I do this? I would first unplug the machine and remove the needle. Feed dogs are usually pretty easy to replace, you have to remove the throat plate first (usually held in place by 2 screws) to get to the feed dogs. Once you remove the plate, remove the screws that hold the feed dogs in place. Before replacing the feed dogs, I recommend clearing out any lint, threads, etc, then oil it in that area if your manual indicates an oiling point. Most sewing machines have similar parts in this area however, I am not very familiar with your machine. HI, I need HELP BAD! I purchased a Singer 750 deluxe model from n estate sale. The previous owner really really took good care of her machine. Anyway, the problem that I’m having is that the needle will not pick up thread from the bobbin. The needle is actually hitting something on its way down. Almost like the bobbin case is in the way. The problem started yesterday while trying to use a very stretchy, lace like material .he material kept getting stuck in the machine. I’m kind of a do-it-myselfer, so any instruction on how to fix this would be great. Thanx in advance. I have a question rather than comment if you will, I’ve a 158.161 kenmore I would like to know whether I can use the kenmore monogram for my low shank machine. Ps I’m a complete novice. Thank you for your vintage sewing machine tips! I thought my machine was just old, but now I can call it vintage. I have a Kenmore 1521, the same model you used to show how to free the stuck feed dogs. I had that problem, and followed your procedure to successful free the lever so it now moves freely between the up and down positions. However, the feed dogs themselves still don’t retract. I’ve also oiled the machine per the manual. Do you have any suggestions to get the feed dogs to move? I actually took the machine to a repair shop, but they wanted more to look at it than a comparable new machine would cost. Athena 2000 ..bobbin will not turn to wind bobbin. Please make suggestions on what to look at and repairs that may need to be made. Thank you so much. Love the blog! I have a 1926 singer model 66-16 I use almost daily, as well as a 6212c singer and a Kenmore 1249 that I use frequently. I also have a new brother 1634d serger. All these machines are set up in my living room lol. Needless to say I am totally geeking out on sewing, and I’m so glad to see other people love these vintage machines as much (or more) than I do. I HAVE A VINTAGE VISETTI MADE IN JAPAN THE MODEL IS 2000 DESIGNED ENGINEERED BY CONTINENTAL SALES &SEWING MACHINES CO. BROOKLYN NEW, YORK, USA JAPAN I NEED HELP WITH FINDING A KIT AND ALSO HOW DO I THREAD IT OH AND ALSO IT’S A DELUXE ZIG ZAG PLEASE HELP ME ANYONE I’M REACHING OUT FOR HELP YOU CAN CONTACT ME THROUGH MY EMAIL THANKING YOU IN ADVANCE.